What is the Statutory Guidance? The Statutory Guidance has been issued by Bòrd na Gàidhlig under Section 9 of the Gaelic Language (Scotland) Act 2005 and consists of two main parts. Part 1 provides Guidance specifically relating to the Education (Scotland) Act 2016 and its provisions for the Gaelic medium primary education (GMPE) request process and the duty placed on education authorities to promote and support Gaelic education. These provisions come into force on 1 February 2017 but Part 1 of this Guidance may be useful in advance of this date to prepare for the provisions coming into force. Part 2 provides further Guidance relating to the provision of Gaelic education in schools. This Guidance is principally for education authorities and builds on the practice and delivery that has been developed by education authorities over the last three decades. Based on that experience, this Guidance aims to explain the different elements that constitute Gaelic education in Scotland and to establish a consistent approach and a clear expectation of what Gaelic medium education (GME) is and how it should be delivered. This Guidance is also for parents. 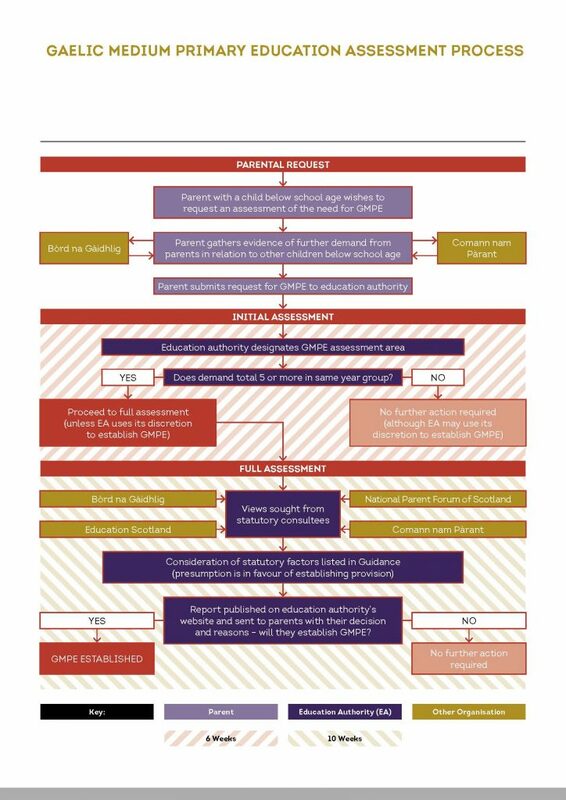 It provides further detail on how to proceed with the submission of a request to an education authority to assess the need for GMPE, and an explanation of how the process works. 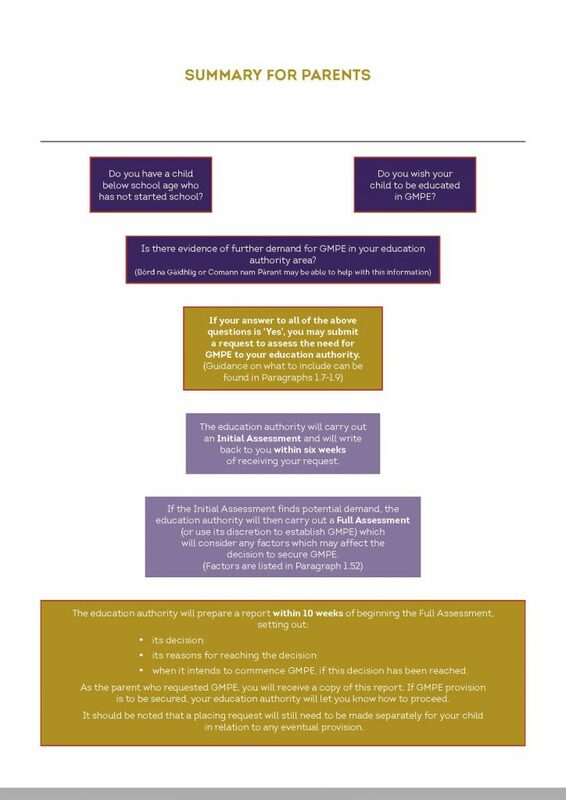 It also provides parents with an explanation of what they can expect if they submit a request to assess the need for GMPE. Beyond education authorities and parents, this Guidance is for all Scottish public authorities, cross-border public authorities with devolved functions and everyone who is involved in Gaelic education. Relevant public authorities must have regard to this Guidance where their functions relate to Gaelic education or the provision of Gaelic education, including GME. As such, there are links between this Guidance and other key statutory Gaelic documents such as the National Gaelic Language Plan and the Guidance on Gaelic Language Plans, both issued under the Gaelic Language (Scotland) Act 2005. Download the Statutory Guidance for Gaelic Education here. The Gaelic medium primary education Assessment Request Form is available on the Scottish Government website. For more information please email stiuireadh@gaidhlig.scot or phone 01463 225 454.